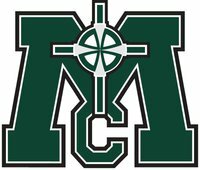 The Muskegon Catholic Central Crusaders will join the Lakes 8 Conference at the start of the 2014 school year, according to a communication obtained from Muskegon Catholic Central. For many years, Muskegon Catholic Central has played as an independent in football, but otherwise held an alliance with the River Valley Conference in sports including volleyball, baseball, basketball and tennis. In the last ten years, the district also rebuilt track and swimming with numerous successes. The Lakes 8 Conference includes Spring Lake, Fruitport, Orchard View, Ludington and Fremont. Howard City Tri-County and Grant used to be the conference but announced their departure just days ago. Newaygo left the conference in 2012 for the CSAA, where Tri-County and Grant will soon join them. The conference says it will expand from six teams back to its namesake eight in the 2015-2016 school year. No official word was available on what the next two teams will be. “I fully anticipate all of our teams being more than competitive and contending for conference championships in any given season,” said Adams. Muskegon Catholic has historically played larger schools in all sports, especially its storied football program. Its independent status often forced the football team to play schools from Detroit, the Upper Peninsula, and even Canada.